Cooking for crowds can be an intimidating task. Throw in accommodating food allergies, and the task becomes even more daunting. For all of our gluten-free friends out there, don’t worry, we’ve got your back. While some of your favorite dishes – like mashed potatoes, roasted squash, and even green beans – are naturally gluten-free, most of the meal is not. So, today we’re going to give you some ideas for your meal so that you can have a safe and delicious holiday. And without further ado, here are our seven essential gluten-free Thanksgiving recipes. These simple little gluten-free biscuits make a wonderful side dish at your meal. They’re a cinch to whip up and have wonderful texture. Since they’re made with heavy cream, they have a truly luxurious flavor, which would certainly complement your other dishes. They’re also exceptionally light and fluffy. If you have a touch more time to prepare rolls, these high fiber dinner rolls are a great option. High-rising, golden, and buttery, these rolls go well with any meal. The texture resembles a soft dinner roll crossed with a tender biscuit, making them excellent for sopping up gravy, smothering with cranberry sauce, or using for leftover sandwiches! 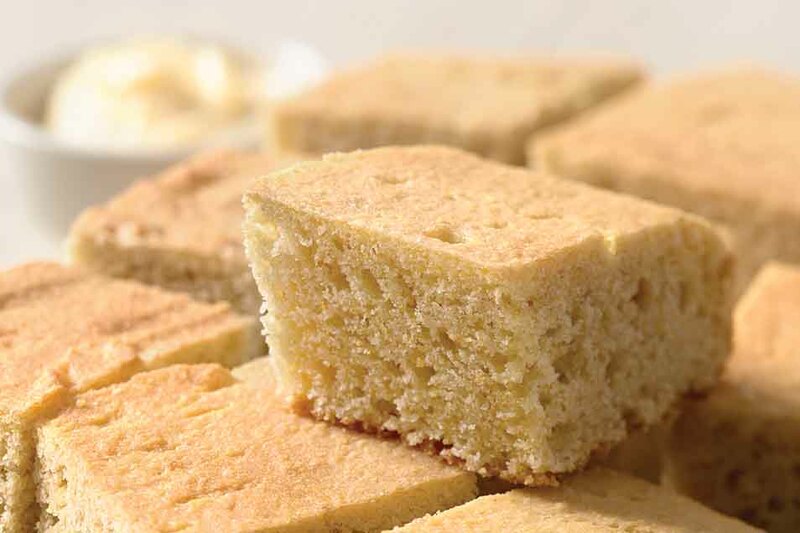 If rolls and biscuits just aren’t really your thing, this cornbread might just be what you’re looking for. Our recipe is a bit on the sweet side, but you can feel free to cut back on the sugar if that’s more your style. We love the mellow flavor of this recipe; and we’re sure it will go well with the array of dishes you plan to serve. What would our Thanksgiving meal be without good old stuffing and gravy? Unfortunately, both are traditionally filled with gluten – which is why we reformulated the classic recipes and made them gluten-free. And the best part? No one will ever be able to tell! And now for dessert. Pies of all sorts can be found on our Thanksgiving tables, so we wanted to be sure that you had a crust you could count on for all your gluten-free guests. Our gluten-free pie crust is a very basic recipe, meaning you can fill it with whatever you’d like! Pumpkin pie is a favorite around here, and our gluten-free version is absolutely sensational. With its flaky gluten-free crust and silky smooth, perfectly sweet filling, we may be a little biased; but we think this beauty should be a staple at everyone’s Thanksgiving table. Pie not really what you had in mind this Thanksgiving? No problem! These pumpkin cake bars are your winning ticket at the autumn dessert table. They’re moist and tender, just as a cake should be; but it’s the thick cream cheese frosting that makes them really sparkle! Thanks for the recipes! I’ve been cooking and baking gluten-free for about 13 years. Many “bread” or cake recipes that are made with pumpkin can be made with gluten-free flour, and no xanthan gum is required. (The pumpkin is “sticky” enough to make up for the lack of gluten.) If you’re new to gluten-free baking, make sure you inspect your baking and cooking “tools” (underside of the mixer, corners of baking pans, etc.) to ensure they’re free of gluten. Don’t bake other things that contain gluten at the same time. And if there are any items or ingredients you’re not sure about, save the label and call the manufacturer (or visit their website). I just made a large batch of zweibach for our Thanksgiving meal and put them in the freezer. I’ve been making them for years now..but this is the first time I have made them with King Arthur. Wow, they were beautiful. I will be using this flour family om now on. It’s just more difficult to find. Would you please share your recipe for Zweibach? I haven’t had Zweibach since I was a child! In fact, Ive forgotten all about it until I saw your comment! Please?!!! !